Joseki wrote: What would be the point of this couple? Both in Ha and Q Asuka has been a secondary character heavily hinted as has a romance option for Shinji. We never had any hit of her (or Mari) being bi or lesbian. Mari herself seems to be aware of Asuka's feelings for Shinji and she tried to get them closer. 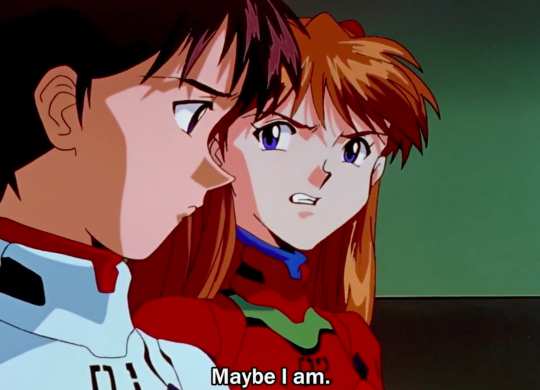 After the events of Q it wouldn't even be a shock for Shinji since he expects to not be loved by anyone, so I can't really see what would be the purpose of them being together. Because Shinji isn't the only character, it's been years, and people move on. 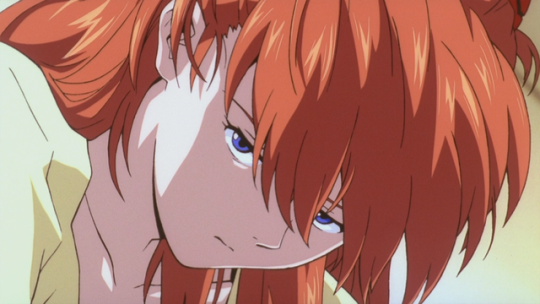 Nothing he did in 2.0 or 3.0 gives Asuka any reason to be romantically interested in him anyway, and certainly not enough for her to carry a torch for him for a decade and a half. 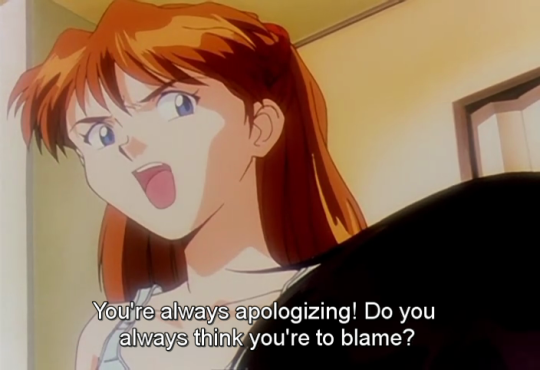 Giving her a relationship with Mari would not only give a good opportunity to develop Mari as a character without taking screentime away from the rest of the cast, but would also give Asuka more of an inner life and generally make it feel less like the Rebuild cast is a series of cardboard cutouts whose lives revolve completely around an impotent lead. We never had any hit of her (or Mari) being bi or lesbian. esselfortium wrote: Because Shinji isn't the only character, it's been years, and people move on. Nothing he did in 2.0 or 3.0 gives Asuka any reason to be romantically interested in him anyway, and certainly not enough for her to carry a torch for him for a decade and a half. 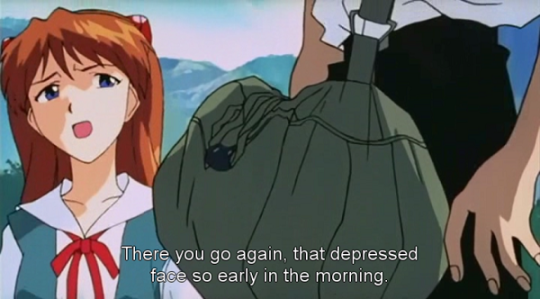 Giving her a relationship with Mari would not only give a good opportunity to develop Mari as a character without taking screentime away from the rest of the cast, but would also give Asuka more of an inner life and generally make it feel less like the Rebuild cast is a series of cardboard cutouts whose lives revolve completely around an impotent lead. 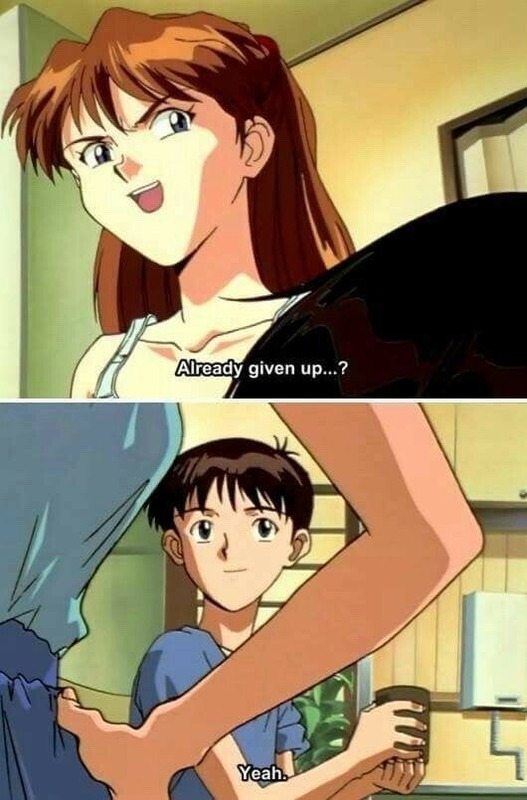 My point is that Asuka as a character does revolve completly around Shinji for the whole two movies and it's undeniable. Even in Q she interacts more with Shinji than she does with Mari or Misato, and she's undoubtedly full of emotions for Shinji, so in a way or the other she will have some other development with Shinji. Making her and Mari a couple wouldn't help Mari's character develpment at all, unless Anno focus the second half of the final movie on the two being reunited instead of trying to answer questions rised in the previous movies. I think that what Anno set up for Final, Mari alone with Wille/Misato, is the best possible scenario for her character and could let the viewer finally know about her intentions and her past. The only meaningful ship in Rebuilds that had some chances of happeing during the movies and not being something implied in a post-Final scenario was Shinji and Rei but it sank hard in the last movie. That's a fallacia ad ignorantiam, if it can be considered as an argumentation. Last edited by Joseki on Thu Jan 19, 2017 12:52 pm, edited 2 times in total. 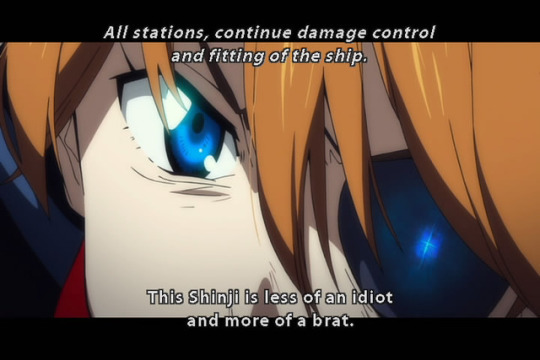 All ships in eva have ended up badly. Hikari/Toji, The closet thing to happy ending, but toji loses his leg. 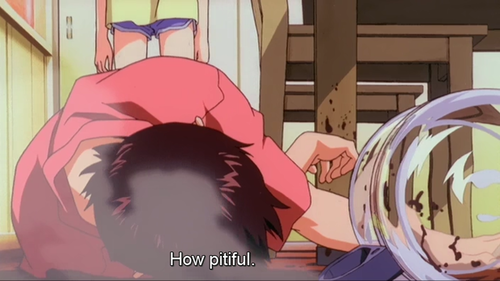 Shinji/Rei in NGE/EoE, I doubt that Rei ever felt romantically for Shinji, but Rei the "human" basically dies and becomes Lilith, a goddess who is to watch over but not live with humans, and of course even if she didn't she still has the body of his mother. 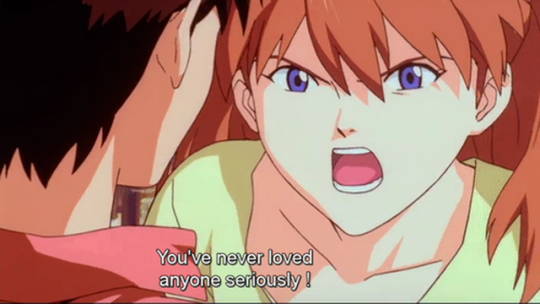 Shinji/Asuka in NGE/EoE, Asuka ends up disgusted(and rightfully so) of Shinji by the end. Honestly I given that track record I would hope that no one is shipped in 3+1. It just bad luck. 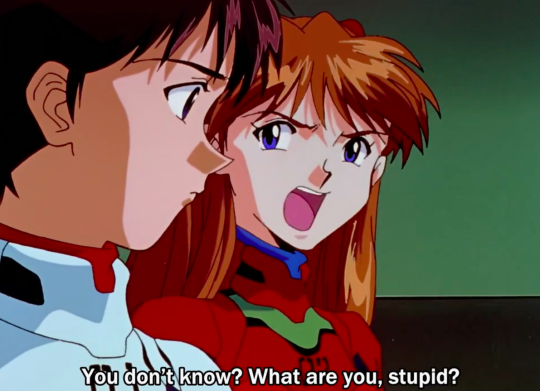 Joseki wrote: My point is that Asuka as a character does revolve completly around Shinji for the whole two movies and it's undeniable. Even in Q she interacts more with Shinji than she does with Mari or Misato, and she's undoubtedly full of emotions for Shinji, so in a way or the other she will have some other development with Shinji. That's probably true, but that doesn't mean she doesn't/won't have relationships of her own that don't involve Shinji (though it's worth noting that Suimame's doujins have shown us pretty compelling depictions of Shinji and Asuka working through their issues even as Asuka and Mari are in a relationship of their own -- I don't know how (or if) there was a final resolution there, but it was both believable and very Eva so I can only shrug at people who claim there's no way to make it work going forward). I don't think it was meant to be anything more than a joke. Oh, come on. They'll get better. This is what happens when you fixate on someone who just isn't into you. It's just a flesh wound! I'm sure he'll walk it off and he'll be fine. It's just as well. Hooking up with eldritch abominations in the bodies of clones of your mom probably isn't the hottest idea anyway. Familiarity does breed contempt . . .
More seriously, The relationships we see in the show are all brief snippets in time. All of the characters mentioned could (and hopefully would!) grow and evolve with time, and in so doing would either grow into their respective relationships or move on to bigger and better things. That's just how things work in real life when you have 60+ years to work with as a healthy adult. Last edited by Bagheera on Fri Jan 20, 2017 3:11 am, edited 1 time in total. 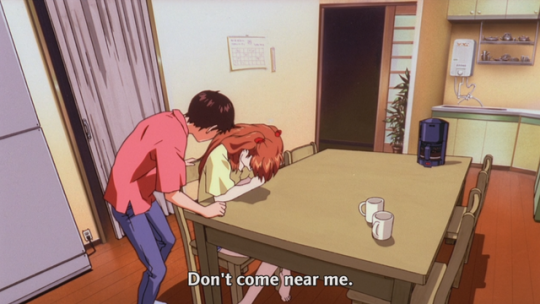 All I can and could say was that if they are/were, it's their business unless Anno gives in to the customary fan service promise at the end of every Eva anime project and shows them kissing at least. You're all wrong. Mari and Maya are gay for each other. Asuka is obviously jealous, but won't admit it. Mari sees this and teases Asuka as a result. 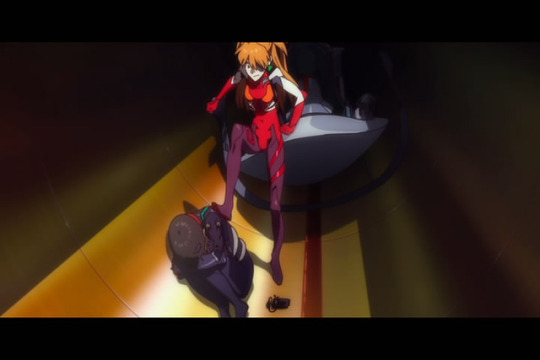 Asuka has become the harley quinn of eva. One half(most male) want her to whit a guy who violent, selfish and treat female like crap. While the other half(most female ) want her to be whit a girl who more more dangerous and crazy then she is. Neither are good choices for her. I don't know how anyone can go around saying anything romantic was going on between her and Shinji when it the most toxic relationship in the anime and movies. When is strangling someone consider romantic? And then there this look on her face after she call him a liar. 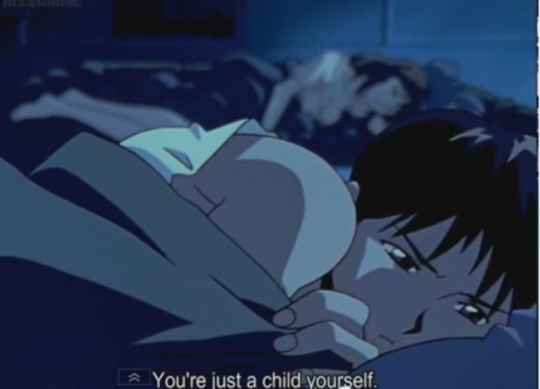 That face of girl who see Shinji for what he really is and don't want anything to do whit him. Does this look romantic to anyone? I don't know why people can't accept this two will never get along. 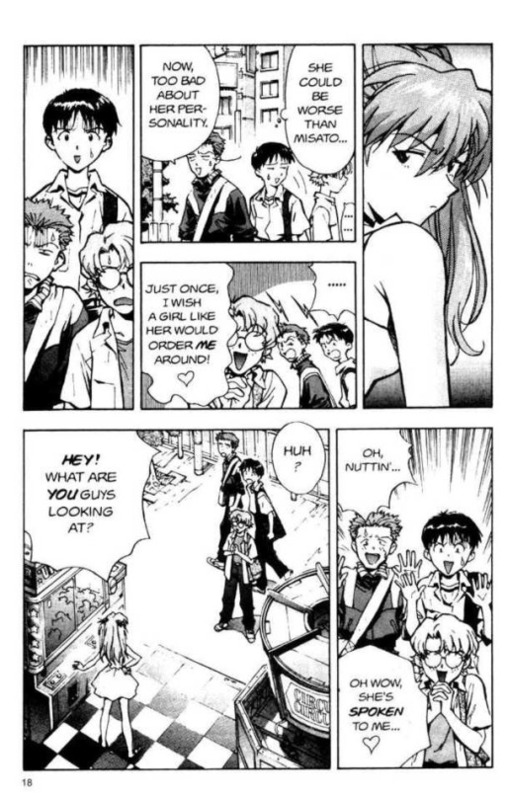 It may have been in the manga but that as close your gonna get to anyone having any real romantic feeling for Asuka. Kensuke maybe a bit odd but he a lot better and healthy choice then the people everyone else want her to be whit. Asuka is trouble girl that needs help and putting her whit people who are worst than she is wont help her get better. Anyone who watch the series knows kensuke is the type of guy who like to help people, he help Shinji so why not let him help Asuka too? Your NGE images barely relate to what you say; the EoE ones are from a single scene which is not even real life; the manga scene is before they even knew each other. The Rebuild scenes are more indicative - but really only when taken in isolation. If Mari and Asuka are gay ..... they'd be gay. What else is there to say? They'd still be Mari & Asuka. Mr. Jive, honestly I don't care if Asuka 'll ever have a real relationship, because she's a strong and independent women who doesn't even need a boyfriend or girlfriend. If no one isn't worthy of her love, then she doesn't need one. Mari on the other hand is mostly just her "friend" and "partner", even if she just makes jokes about Asuka caring for Shinji, which Asuka denies of course. Though Mari is the only one right now, who cares about Asuka. If Mari would see in FINAL how Asuka is about finish off Shinji herself, then her hopes for her "princess" and "puppy" to be together is about to die brutally out. And Shinji, he did the mistake to let her down when Matsushiro happened and made her live in a world that was affected by an Impact again, that he almost made it happen and disappeared for an eternity. 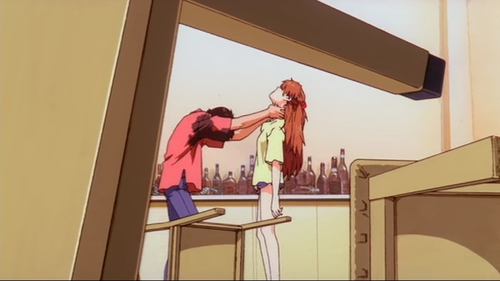 Asuka should've had enough time during those years, to know who Shinji is for her. When he came back, she made it very clear to him, that it's his fault what he did to her and mankind. 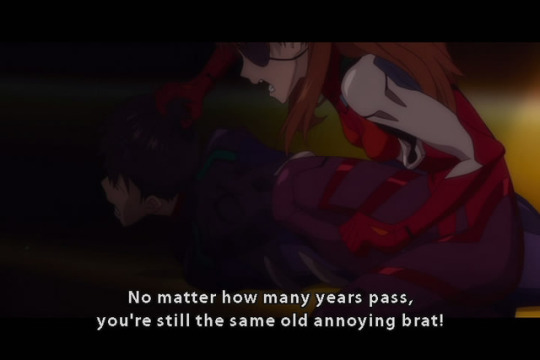 She want's him to take responsiblity and to be punished, but when he escaped from WILLE and was manipulated by Gendo and Kaworu, she calls him a "brat" for this. 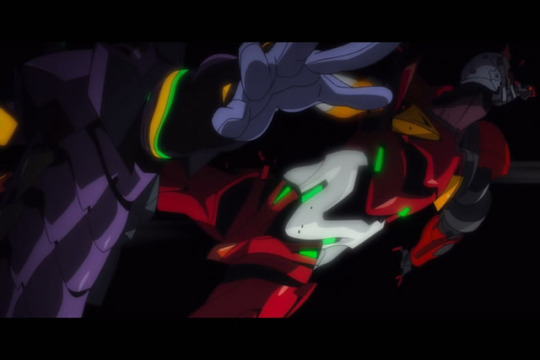 When Shinji and Kaworu were about to initiate Fourth Impact, she was definitly about to kill them. 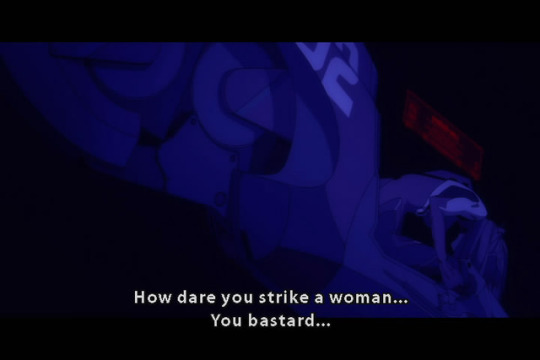 I don't think that her way of "punishing" Shinji meant, that she would spare his life, it meant either them or the world was fucked. When she got him out from his entry plug after the battle, she was still angry to him and drags him through the impact infested ruins of the outskirts from Tokio 3, to reassemble with WILLE again. For the last five years we don't know what 'll happen in FINAL and how it ends, after what was in 3.0. 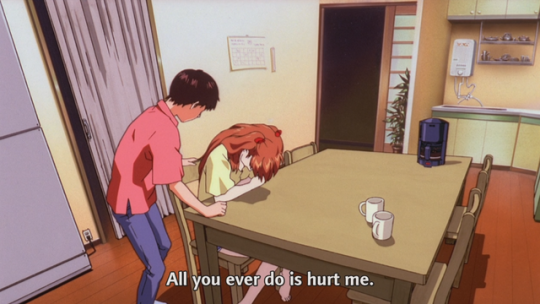 Shinji would think that Asuka hates him and that she' ll make him suffer and he would let her do with him what she wants, for hating himself. Asuka though 'll have to realise, that what she thinks is hate towards him and that she 'll finish him off, would only make it worse and makes her regret it. But what's most importaint, is that their conflict must end and that they have to confront their problems with each other, realising their mistakes and how it ends doesn't matter as long as they won't trigger an Impact again and that it's certain that it 'll end. Gendo'sPapa wrote: If Mari and Asuka are gay ..... they'd be gay. Yes, its this kind of focus on who any character wants to get down with in any kind of show that is rely just annoying as hell. So what, the character is gay, or surprise, bisexual, or holy crap, their 's still straight characters in 2017! Sexual orientation of a character is only a small part of characterization, and really doesn't mean much unless the show is going to focus on the various social issues that are involved with being a different sexual orientation. Shows like "The L Word" and "Queer as Folk" (UK and US versions) are where a focus on sexuality makes sense. But most other shows, its a background part of the characterization, and the sexuality of the characters really isn't of major importance in the grand scheme of the story in a show like NGE. So, in a roundabout way, what I'm trying to say is that whether any of these characters we're all so fond of are straight, gay, bisexual, or transgendered, or anything in between, we'd still be enamored with the show and the deeply complex characters we've come to love. But in-universe, Mari and Asuka being gay is pretty meh. Honestly, finding out that Maya was possibly gay for Ritsuko in EoE only added an extra little bit of cute to re-watching the series. (And Maya was cute before that revelation, so... whatever.) Beyond that, little was changed by it. The real deal is Mari and Rei Q being gay. Joseki wrote: The real deal is Mari and Rei Q being gay. The Fruit of Life is held by the Angels. The Fruit of Wisdom is held by Man. Imma be honest. I did not expect this thread to explode the way it did. Maya is sooo adorabley cute. I do like that idea in the rebuild universe since Rei is in a way Yui's daughter and the manga makes it very clear that Mari was in love with Yui but was rebuffed as Gendo was chosen over her.